Located at the foot of the slopes at 100 meters from the gondola allowing a departure and return ski to the feet. 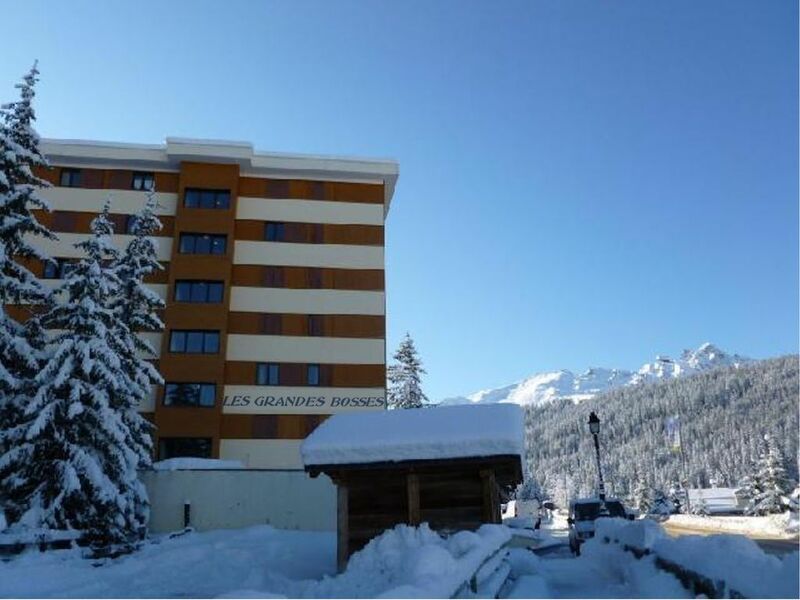 The Grandes Bosses building offers a view of the living room on the mountain of Courchevel 1850 and rooms overlooking the Club Hotel and shops. Apartment of good standing completely renovated in 2011 by an interior architect. Balcony of 10 m² south facing. Bathroom with bathtub shower. Separate toilets. Apartment of very good quality done again in new in the style chalet contemporary in 2011 by architect of interior. Direct access to the slopes. Shops 150 meters away. Perfect size for a family of five (ages 11, 8 and 6), with one twin room, a bunk-bed room with 4 bunks and a 'corridor room' with 2 bunks. Short walk / ski to a lift for access to the slopes and a short walk (< 5 mins) to the village amenities. Just returned from a week family of 6 ski holiday, staying and that apartment and wish we were still there!!! From the outset Mr Guillard was very helpful and accommodating with the booking, even finding us with alternative parking due to the size of our vehicle. Louisa the Caretaker was very helpful and couldn't do enough to help. The apartment was excellent in both location and the furnishings/equipment provided. There was always plenty of hot water and the heating was at comfortable temperature at all times. The ski/boot room was secure and easy to use with quick access to the Petit Moriond lift meaning that you were on the main ski runs in no time at all and with little fuss. A decent sized supermarket for ski resort only 100m from the apartment and a bakery only a little further on. Had everything your needed for a great holiday. We thank you for your very nice remarks on ABRITEL HOMEAWAY. We would be pleased to have you again in Courchevel. Bonne description de l'appartement, c'est ce à quoi nous nous attendions, nous étions 2 couples avec 2 Ados chacun, et avec une bonne organisation et surtout une bonne entente tout à été parfait....propre, fonctionnel, une gardienne qui n'a pas hésité à nous prêter un casier à ski supplémentaire car pour 8 skieurs un casier ne suffisait pas. A deux pas du centre de Moriond, des commerces et de la navette. A refaire. A group of four (two couples) of us stayed here for a week at the beginning of February 2016. The accommodation was perfect for our needs. Great location. A few steps from the boot room was a ski slope, which we used to ski down to the nearest lift just a few metres away. The apartment was spacious with a nice sized balcony (albeit a bit too cold to use!). The building caretaker was helpful and very easy to deal with, and did not have any problems with our late arrival. Restaurants and shops were just a couple of minutes walk away. Michel, the owner, replied promptly to any questions and was a pleasure to deal with. We will be using this apartment again! Just returned from a week family of 5 ski holiday in this apartment. Excellent accomodation, very well furnished and equipped. Ski and boot room very easy to use and ski in ski out very attractive. Supermarket 1 minute away. Always very warm with plenty of hot water every night! Building is very quiet and immaculately clean. Caretaker is very friendly, always cleaning and smiling and checking if everything is ok.
We've stayed in 1650 for the past 10 years at various accoms but this takes some beating and we'll rerturn here in future. Owner is excellent communicator, answering questions promptly etc. Thank you Michel! First impressions of the place were good. Nice, clean apartment if a little small, but great value for the money. This is certainly not luxury but adequate for what we wanted. There is a small lift right behind the apartment and you can ski down to the main lift from there. The caretaker however does not speak any English. We had ski's, boots and poles stolen from the boot room and although explained to the caretaker she did not want to have anything to do with it. As a group of 6 we only had 1 set of locker keys between us and at varying levels of ability did not all return at the same time. This meant that at times we could not lock the gear away in the locker. It was also strictly forbidden to bring ski's boots etc up to the room. What should have been a cheap ski trip ended up being quite expensive for some! The largest ski area in the world - Courchevel 1650 is connected to Miribel Mottaret - Les Menuires and Val Thorens. Toutes les locations démarrent du samedi à 16 Heures au samedi suivant à 11H. Pour la réservation un acompte de 30% est demandé. Un contrat de location saisonnier de 2 pages sera signé entre le locataire et le propriétaire.